INTV Advanced Dungeons & Dragons: Cloudy Mountain in 00:11.62 by TheWinslinator. Advanced Dungeons & Dragons: Cloudy Mountain was released for the Intellivision console in 1982 and was the first licensed D&D videogame. Though it bears little resemblance to the iconic tabletop RPG, it does have dungeons and it also has dragons. The gameplay involves exploring a series of randomly generated mazes, searching for tools or arrows with which to progress on the overworld map, or to defeat monsters. The end goal is to reach Cloudy Mountain and recover the Crown of Kings from the fearsome winged dragons. 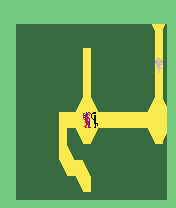 In the site's first ever Intellivision publication, TheWinslinator uses both controllers and a major skip to retrieve the Crown of Kings in record time. If you're itching for more Advanced Dungeons & Dragons we also have a run for the second title Treasure of Tarmin.